Launching a blog site these days no longer is just for fun. Many of us are now blogging to promote our business and you know how hard it is to plan for a blog, especially since you have to consider everything from its layout, to the theme, the content and most important of all, how you will attract readers. To top it all off, you have to come up with ways to turn readers into loyal readers, which is not an easy feat. That’s not the worst thing though. The worst thing is that despite all of your efforts, that your blog still do not have enough readers. Now, if you are just blogging for fun or as a hobby, you could not care less about it. Anything you take from monetizing it is just a bonus. However, if you have a business blog, not getting enough traffic is the worst thing that could possibly ever happen. But the good thing is that it's a problem that you can easily solve once you know what your blog site is missing, things of which will be discussed below. 1. Logo. A logo creates brand awareness. It gives your blog site a face to your readers, something that they can remember it by. Put it simply, your logo is a subtle, yet very effective way, of making your readers remember what your blog is all about and in turn, remember what your business is all about and what its products and/or services offered are. I got my official logo designed from 99designs. 2. Clear Navigation Bar. The navigation bar should be clean and simple. Your readers are after the content of your blog. They do not want to have to deal with too much design. Much like your content, the navigation bar should be straightforward and most important of all, user-friendly. 3. 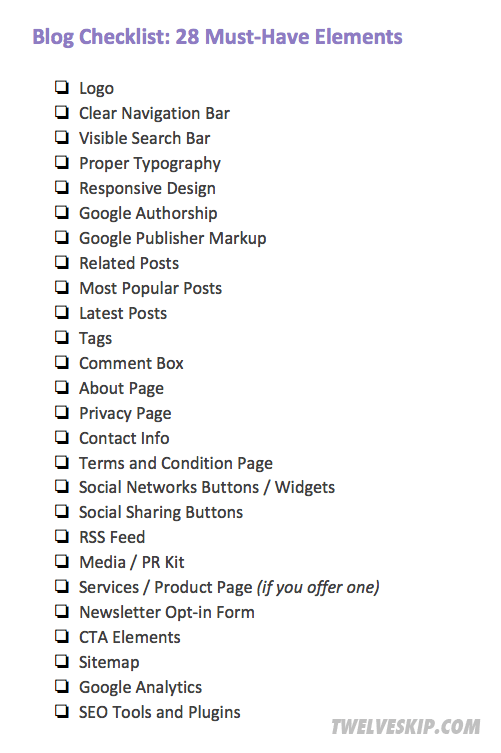 Social Sharing Buttons Within Blog Posts. Increase your chances of going viral by making your content easy to share on social media. I am currently using SumoMe plugin for my social buttons + image sharer (It works with WordPress, Blogger, Squarespace, Shopify + more). 4. Visible Search Bar. This might be one of the first thing your readers will look for especially your new visitors, so don't make it hard for them to find your search box. I recommend you to add it above the fold, it can be on your header or on the top sidebar. 5. Proper Typography. Your fonts can affect how well a reader perceives your blog posts. True, it is highly debatable that it is the content that matters, but readers will likely agree that if the font is easy on the eyes, they will most likely read most of the material. My #1 rule is never use font less than 12px! For awesome examples, read: 15 excellent examples of Web typography. 6. Responsive Design (Mobile-friendly Layout). Here are the 3 big reasons WHY you need to have RWD: 1) It’s better. According to KeyNote, "46% of mobile users are having difficulty interacting with a web page, and 44% complain that navigation was difficult." So if you care about your visitors, make it easier for them to navigate your site in any screen sizes especially for mobile users. 2) Google recommends it, which means you need it for SEO. 3) It's 2014. The future is mobile. 7. Related Posts, Most Popular Posts and Latest Posts. These three help in keeping your blog site as organized as possible as it can help readers get to know what’s the latest, what’s trending and other posts related to what they are reading, further increasing traffic and subtly giving readers more reasons to stay. 8. Breadcrumbs. If possible, add breadcrumbs to your blog site. It makes navigation a breeze and helps readers understand what topics what they are reading belong to. 9. Tags. The same goes for tags, but what makes tags so important is that they not only keep your blog site organized, but also allow search engines to know what “topics” are covered by each post, acting like keywords of sorts. 10. Comment Box. As much as possible, use a CTA that encourages readers to interact with one another or post something in the comment box. If you have a large enough reader base, they will discuss the content of each post on the content box and may even provide additional insight that you can use later on. 11. About Page & Contact Info. These pages are self-explanatory and they are necessary because they complete the overall professional look that you will want your blog site to have if you want to attract readers and increase overall traffic. 12. Privacy Page / Terms and Condition Page. It’s important to have these pages especially if you do a business on your blog. Plus, if you plan to sign up for advertising programs like Google Adsense, you definitely need these. 14. Follow Buttons or Social Media Widgets. This is the best way to save and increase loyal followers by making them follow you on other social networking sites. Make sure you’re on the most popular social media sites including Facebook, Twitter, Google+, Linkedin & Twitter. 15. RSS Feed. RSS feeds are a big help because it is your way of giving to the readers. This is because RSS feeds allow readers to keep themselves updated with things that they are interested in, or new things about websites or businesses similar to yours. 16. Media / PR Kit. Your blog’s media or PR kit should consist of complete information on advertising opportunities and policies. Make sure to include Google metric stats and social proof as well. Having a complete media kit will help you talk about your brand and in promoting it. Therefore, it is important in driving more traffic. For more info, read: Media Kit: What Is It, Why You Need It, How To Make One. 17. Services / Product Page and Payment Options. Blogs are made for a reason and it’s not just to give valuable content. It is your way of advertising to your readers as well. Make sure that you capitalize on your reader base and further increase traffic by including a services or product page in your blog site. If possible, include payment options as well to make everything easier for your consumers. 18. Newsletter Opt-in Form. Newsletters build brand awareness, consumer trust and loyalty. Make use of it. Yes, it requires sacrifice, but in the long run, it will benefit your business. I recommend Aweber (currently using). 19. CTA (Call To Action) Elements. CTA elements are also important, especially since a call-to-action helps motivate readers. Motivated readers eventually become buying consumers and if satisfied, they will recommend your products and/or services to other people for free. Make sure you have a very clear CTA elements on your site, it can be a "BUY now" button, "Click HERE" button..etc. You get the idea! click here for effective examples. 20. Sitemap. Your readers will not be able to see this, but search engines can and they need this to know what pages your blog has and how they will search through it so that your pages have a chance of being ranked high. I use XML sitemaps to generate a sitemap for me. If you're a wordpress user, you can use Google Sitemap Generator or Sitemap Generator. 21. Google Analytics. Google analytics gives you concrete numbers that will show you what is wrong with your blog, what is missing, how you can improve it and later on, numbers to show to interested advertisers why they should purchase advertising banners in your blog. 22. SEO Tools & Plugins. While SEO has mellowed down over the past few years, it still plays an important role in driving traffic and putting your site on the map. Use tools and plugins to come up with proper keyword placement, frequency, etc. so that you drive traffic to your blog site and somehow, cheat your way through the page rankings. If you're a Wordpress user, I recommend Yoast. 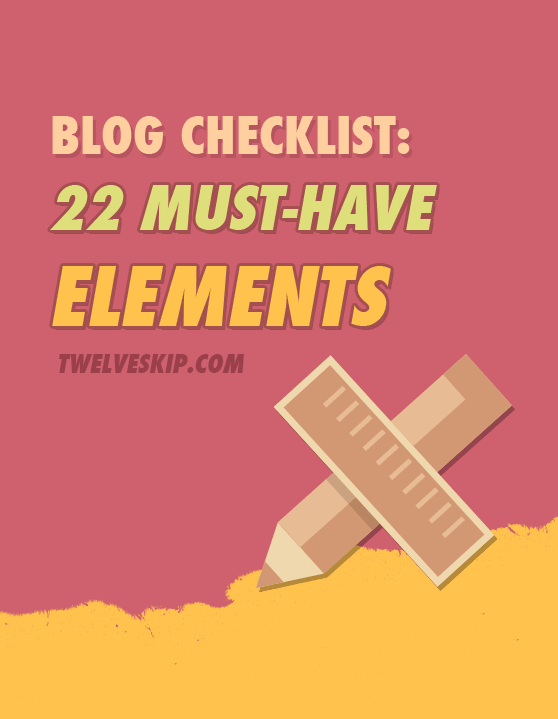 Use this checklist to see if you have these essential elements on your site. Be sure to focus not only on driving traffic, but also in keeping the quality of your content as high as possible so that readers will keep on coming back and those new to the site has a reason to stay. If you have any questions or any additional tips, please share your thoughts in the comments below.